Oh you were too kind yesterday, indulging my Hill-love, and I thank you enormously for that. Now I think for the time being I'll stop staring out the window and concentrate on something else. So today as promised, here's something altogether more colourful, creative and inspirational. Yeah, thats more like it, back on track and not a hill in sight. When I first learnt to crochet last summer, I used a little book to teach me the basics, and I wholeheartedly recommend it if you'd like to learn. I spent a few evenings with a ball of yarn, a hook and this book. There were a few curses and hissy fits, but all in all I can honestly say it is not a difficult skill to learn if you really want to do it badly enough like I did. I went up and down in rows practicing single crochet and double crochet, learning how to hold the yarn and hook and create the tension using my fingers. Not too tight and sweaty. Not too loose and holey. Even tension is the key and the thing that takes the most time and practice to get right. The picture above is the beginning of my current crochet love, started around a month ago. There is a whole heap load of Ripple inspiration to be found in Blogland and Flickrville, and it didn't take a lot to convince me to begin one of my own. I so badly wanted to join in the Ripple Along, so much creativity and colour and ripply movement there and I wanted in. My personal favourites that have inspired me on my own quest to Rippling happiness are here, here, here , and here. Beautiful aren't they? Can't you feel yourself being drawn in and itching to give it a go? Yeah!! All you need is some yarn, your fingers and a little magical stick of metal with a hook at the end. Easy peasy. 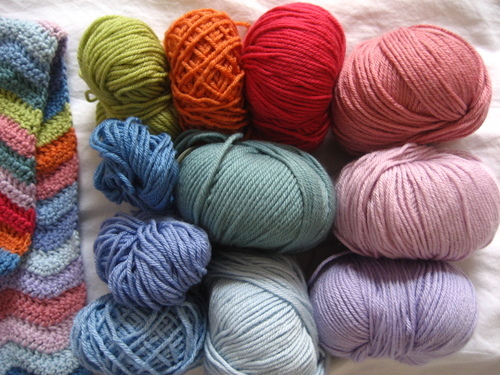 For me, the yarn is where it's at, the texture of the stuff and the colour range available. No yacky cheapo stuff for me I'm afraid, and no mucky, dingy colours either. 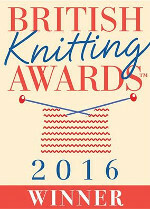 I chose to invest in Rowan Cashsoft yarn for my ripple which is a mixture of Cashmere, merino and microfibre. The colours are scrumptious, and the yarn itself is beautifully soft and very snuggly and blankety. It makes my eyes water paying for it mind you, at £4.75 a ball with the whole blanket needing oooooh maybe 25 or so balls? Hmmm, note to self, better not tell J that exact truth eh. 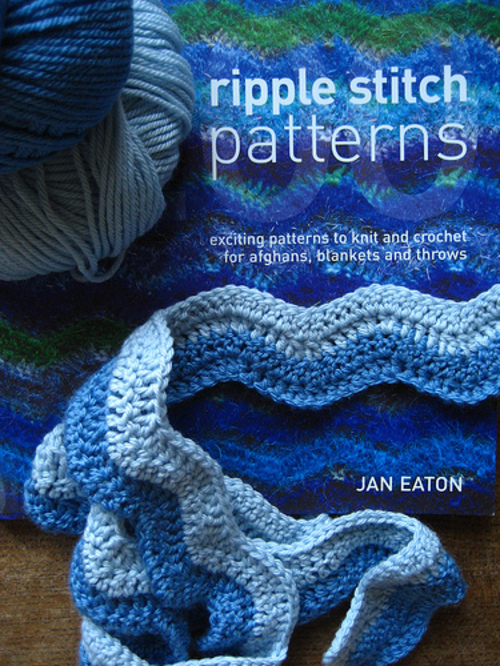 The pattern is one that seems to be popular amongst ripplers and comes from Jan Eatons book pictured above, its the Soft Waves pattern. I don't own this book, but managed to order it from the library. 60p well spent in my opinion. There is also a very similar version of this pattern in this book which was mentioned recently on the Posie Gets Cozy blog. Now I do own this book and drool over it a lot, the photography is beautiful. I haven't worked out the order of colours in advance. No, no. I don't do complicated charts or stripe generators. But I did spend a considerable amount of time sat on the floor of my local wool shop with ALL the Rowan colours pulled off the shelves and spread out around me, selecting an initial palette to work with. My idea was to mix soft pastels with a few zingy brights to perk up the waves and I think it is looking OK so far. Although the bright raspberry pink colour was a new addition bought after the first colours were chosen. Before this colour came along, the whole thing was not quite as perky as I wanted. It was just not quite bouncing as it should. And I like perky and zingy and bouncy, makes me smile. 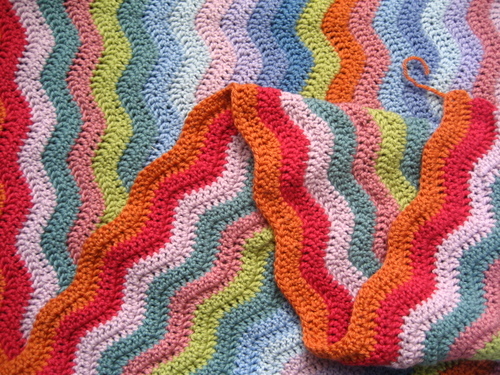 Twenty Four stripes done in about a month or so, which is about a quarter of the way. 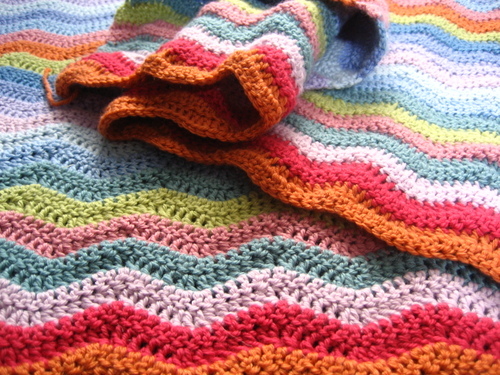 So by that reckoning my warm, snuggly wool blanket should be finished in time for high summer. Timing was never my strong point, but an Eye for Colour, yup, I'm not bad at that one. can you tell me please the colors ref you used to this??? Can I ask...how wide do you make your blankets? 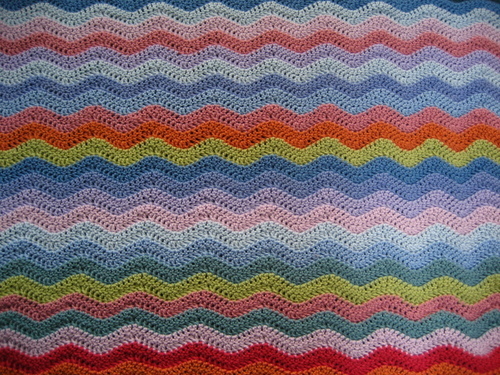 I think yours is one of the nicest ripples ever- in fact yours is the nicest crochet I have seen on flickr in ages!! - just got the pattern today, yarn arriving tomorrow! I've drooled over every ripple blog post I have read, there have been many. It is Autumn here and I could start now and have one done by mid winter ... ok I'm in. Now to go choose some colours. I really love your zingy choice of colour, very tasty. Your blanket certainly has zing! It looks perfect to wrap up in on a chilly summers eve in the garden!